Please consider recommending that your university or department librarian order this book. Thank you! "This book contains a detailed treatment of linear algebra, and how it can be applied to the iterative solution of elliptic boundary-value problems. In Chapter 5 the author attacks the interesting and difficult problem of comparing the numerical work required to solve large elliptic problems by his SOR-like AGA method, with the numerical work required using newer computational methods, such as Krylov subspace methods and GMRES. His conclusions here are quite unexpected! Indeed, for some problems, he found that the SOR-like methods were superior to Krylov subspace methods by several orders of magnitude. This chapter and the corresponding numerical experiments detailed in the appendix form one of the most interesting contributions of the book. He also gives a very complete study of the theory of matrix splittings in Chapter 2, which includes his own research in this area. Finally, he includes a new and interesting chapter on the use of iterative methods in solving linear control problems, such as the Sylvester equation and continuous-time algebraic Riccati equations. Iterative methods for solving systems of linear equation form a beautiful, living, and useful field of numerical linear algebra. Beautiful, because it is full of powerful ideas and theoretical results, and living, because it is a rich source of well-established algorithms for accurate solutions of many large and sparse linear systems. Useful, because solutions of large systems of linear equations are essential in many fields. The recent literature on iterative methods has been dominated by Krylov subspace methods, currently the most common group of techniques used in applications. The combination of preconditioning and Krylov subspace iterations for solving nonsymmetric linear systems has become a central area of research and new techniques are still emerging. In the vast literature there are a thousand different algorithms, and many derivations and estimates of error bounds; it is difficult for a typical reader or user (and sometimes even the specialist) to identify the basic principles involved and estimate the performance of particular algorithms. These new techniques are called parameter-free methods, because they can be applied without knowing the inner properties of the matrices that one must know in the case of traditional methods. There is a general feeling that traditional iterative methods, based on matrix splittings, are usually less efficient than the Krylov methods, and that to use these methods effectively one must resort to rather complicated procedures for determining optimal acceleration parameters. Therefore, in current applications, the traditional methods have generally been relegated to the role of preconditioners. However, as can be concluded from numerical experiments described in this book, such an opinion is unjustified in many cases. 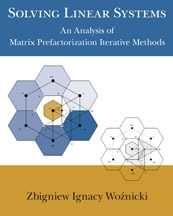 This book is devoted to the description and convergence analysis of iterative methods based on matrix splittings and their implementation in mesh structures. It is in some sense a summary of the author's results and experience gained in this important field of numerical linear algebra. Zbigniew Woźnicki died in March, 2008, before editing was completed. Two of his friends and colleagues, Janusz Mika of the Institute of Nuclear Research in Otwock, Poland, and Robert Beauwens of the Université Libre de Bruxelles, wrote the following notice. Zbigniew Woźnicki (Institute of Atomic Energy of Poland) passed away early morning on Saturday 1 March, 2008, as the result of a mesenteric embolism, leaving his wife Ewa and two daughters Agnieszka and Ola. Together with Varga, van der Vorst and Jennings, he was one of the fathers of the incomplete factorization algorithms and of the associated iterative methods. His PhD thesis, published in 1973, although at the beginning not appropriately acknowledged, represented a true breakthrough in the development of these methods, as well as in the general theory of regular splitting, paving the way to countless extensions and leading to many present day applications of ILU factorization algorithms and of their numerous variants. His recent works included the use of the iterative solution of large linear problems arising in the field of control system design and analysis. The community of matrix iterative analysts lost one of its most prominent members. We, his colleagues, lost a warm and devoted friend.